Like many things related to Champagne, the National Day of Champagne itself is hotly debated. Some clamour for the 31st of December which clearly makes no sense as that day’s already pretty packed. Others supposedly go for sometime in October, but that’s obviously a private party since I couldn’t find a concrete date on the web. So the only real contender has to be the 4th of August (which also happens to be the day before my birthday, and thus well worth celebrating!). As if that wasn’t enough to convince you, the 4th of August also has some charming folklore behind it. According to legend, on this day in 1693 the infamous Benedictine monk Dom Perignon discovered his wine had developed bubbles. A curious lad, he thought he might as well try this botched concoction (why waste wine, after all?). Voilá, Champagne was born! In honour of this grand occasion (did I mention it’s also my birthday? ), I’ve scoured the internet to find the world’s weirdest and most wonderful Champagne pairings. There’s everything from elegant Champagne cocktails to down-and-dirty junk food combos. Hopefully it’ll inspire you to construct your own Champagne feast to honour this glamour-puss of this wine world. For the ultimate Champagne birthday, take a look at this awesome Pineapple and Coconut Champagne cocktail. Shanna uses Prosecco in her recipe, but it would be just as delicious made with Champagne for a summer garden party. Or just for lounging in the backyard with a good book! If you’d rather keep things classic, why not go with France’s favourite aperitif, the Kir Royale. Girl Versus Dough has a gorgeous version which includes pomegranate. It looks classy, but the recipe is really simple and you can always substitute raspberries or strawberries if pomegranate is not in season where you’re at. For a double-dose of good old vitamin C, Erin at Well-Plated whips up a mean Strawberry Basil Champagne Sparkler to tempt those with sweeter tooth. To go with these graceful creations, you really ought to make some canapés. They don’t have to be complicated affairs. Christy Majors at Confessions of a Culinary Diva created these awesome Caviar Dreams which are super easy to make. Layer smoked salmon on cucumber slices and top with a little crème fraiche and caviar. Simply sublime and effortlessly luxurious. To provide a little balance to all that alcohol, check out these Kale Pesto Crostinis from David from Cooking Chat. The bubbles help to refresh the palate after the kick from the garlic, plus your body will thank you for putting some leafy greens in your grape juice! 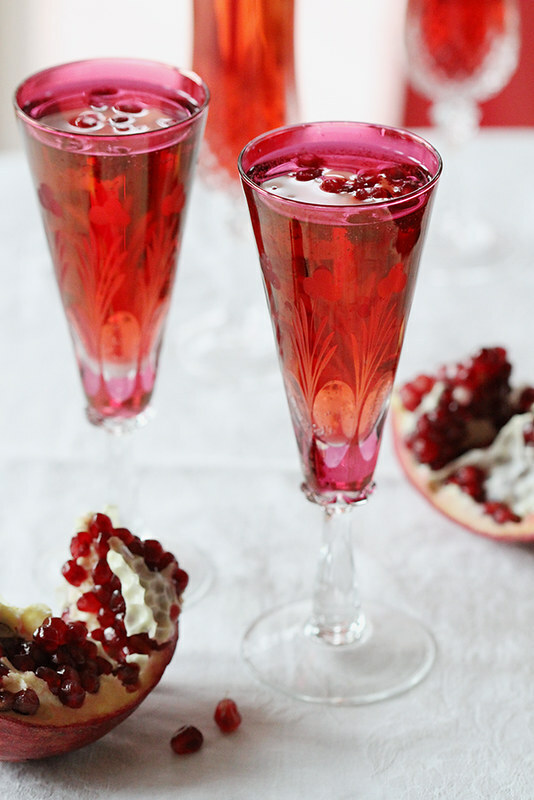 If making a cocktail is too much fuss, why not just add some fresh fruit to a glass of fizz. There’s nothing better than some crispy French Fries (or chips as we Brits call them) when you’re under the influence, so what could possibly top French Fries and Champagne? Combining junk food and high-end bubbly is a huge trend right now. Drync explains that the acidity in the sparklers helps to cut through the richness of the fries, while those bubbles cleanse your palate after each bite. They recommend taking this pairing to the ultimate level by adding some truffle oil and shavings of Parmigiano-Reggiano; a good quality Champers will bring nutty, earthy flavours to the party, matching perfectly with the cheese and truffles. The second best food substance known to man has to be fried chicken. Michelle Williams gets my prize for the naughtiest Champagne pairing to make the list, Korean Fried Chicken. The recipe has a bit of spice which is nicely balanced by the acidity in the Champagne. My final greasy fingers pairing is a bit of a throwback. For those of you who remember the eighties, you probably recall that oddity known as the fondue party. Tragically I’m too young to have actually attended, but I do remember seeing strange-looking cauldrons at various relatives’ houses and wondering what they were for. Cindy over at Grape Experiences picked a yummy 70% Pinot Noir, 30% Chardonnay Champagne called Le Medaillon Brut to match a decadent Camembert fondue. Just add some cheesy eighties tunes, and you’ve got the perfect retro party! Culinary Adventures with Camilla takes us into the sophisticated, grown-up realm with her Lemon-Poached Scallops with Caviar Limes. In case, like me, you’ve never heard of caviar limes they’re actually a type of fruit with a distinctive lime flavour and a texture similar to caviar! Lori and Mike from Dracaena Wines are also keeping things chic with their Asian Lettuce Wraps. Made with ground turkey, plenty of spices and steamed brown rice, this is the perfect light meal to re-energize your body after all the junk food combos above. Pair with a Brut Champagne for a touch of sweetness to harmonise with the sweet and sour flavours in the dish. For an evening of pure indulgence, why not plan out a three-course Champagne dinner for yourself and a loved one. The talented Martin Redmond sets the bar pretty high , having crafted not one, but two such feasts. Technically he does use sparkling wine for one meal, but it is a stunning Iron Horse Brut which spends four years ageing on lees giving a rich, creamy wine bursting with pears, mandarins and lemon. Martin’s top Champagne pairing dishes include King Crab Legs, Stuffed Salmon with Beet Risotto, Roasted Shrimp Pasta with Lemon Cream Sauce, and, keeping it French, some delicious Macaroons. FYI Martin, I’m still waiting for my invite. Over at Hot & Chilli Rosana has gone for a rich Demi-Sec Champagne paired with white chocolate truffles! Heavenly. She also suggest pairing this style of fizz with pain au raisin or pain au chocolat to complement the bready, brioche aromas typcially found in good Champagne. The trick here is sticking to a medium-sweet (known as Demi-Sec on Champers labels) to match the sugar in these rich foods. As you’ve probably realised by now, that acidity is what makes this pairing tick, balancing out the richness in these sweet treats. Image credit: Rosana McPhee at Hot & Chilli. If you fancy actually cooking with Champagne, these Macaroons with Champagne Buttercream from Miss in the Kitchen are well worth trying out. They make a wonderful gift or Mothers Day present, if you can bear to give them away! Pair with a Demi-Sec Champers for real wow-factor! Have you got any amazing Champagne pairings? Let us know in the comments below! And if you’ve enjoyed the read, why not join us here at The Wine Culturist by simply clicking the follow button at the bottom of the page… We always love making new winelover friends! Haha! Thanks. Think I’ll be celebrating with something bubbly!